Kentucky Science Center is dedicated to providing a quality experience for all of our guests. Please contact us directly at 502-560-7128 if you have any questions about specific accommodations we can provide. Wheelchairs, strollers, and all other Mobility Assistive Devices are welcome inside the museum. Wheelchair-accessible restrooms, elevators, and ramps are located on all floors. There are two entrances to our building, both with accommodations for guests with limited mobility. Guests may be dropped off in the loading/unloading zone in front of our main entrance on Main Street (beside our parabolic mirror.) There is an automatic door with push-button entry to the right of our main doors. There is a wheelchair-accessible overpass, easily reached from the Eastern side of our parking lot. The overpass ends at Main Street, with a side entrance to our lobby. Closed Caption and Assisted Listening Devices are available at Kentucky Science Center’s Digital Theater for select movies. Inquire at the Ticket Desk, or call ahead at 502-560-7128. Nursing mothers can breastfeed in any public area. There is also a “Nursing Nook” in the Grow Zone area of Science In Play on the first floor. If a more private space is preferred, and/or an outlet for pumping, please let one of our team members know so we can accommodate you. Service animals are welcome at Kentucky Science Center. Family Restrooms are located on the 1st and 3rd floors of the museum. Changing tables are available in both men’s and women’s restrooms on the 1st, 2nd, and 3rd floors. Kentucky Science Center is proud to offer programming for families of children with special needs. Our No Limits Family Camps are offered once monthly, early morning—before our doors open to the public. Click here for more information. If you or a member of your party feels overwhelmed at any point during your visit, please feel free to visit our ticket desk or gift shop to check out one of our sensory bags, which include noise-cancelling headphones, stress balls, sensory bottles, and more. If you are a Certified Therapist and wish to bring a client, you will receive free admission with the paid admission of your client. To reserve this complimentary admission, please call 502-560-7128. Your reservation will be available at the Ticket Desk when you arrive. 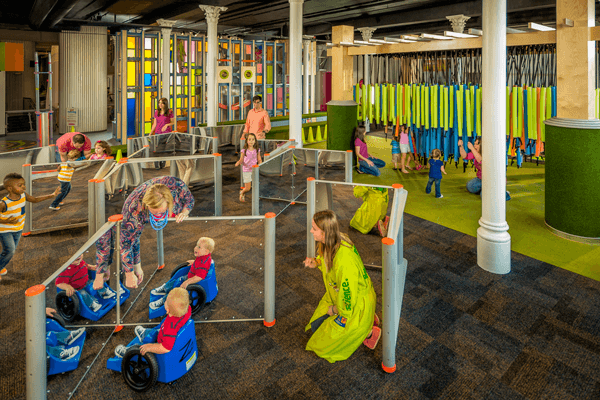 Kentucky Science Center is proud to have been the first business certified by FEAT (Families for Effective Autism Treatment) of Louisville as a Level 1 Autism-Friendly Business. Learn more about FEAT by clicking here.